Abfrage3 is an online vocabulary trainer with functionality to create, share and organize word lists. Its purpose is to make learning vocabulary of a foreign language more efficient. The website is not being actively developed anymore. Some features might not work as expected. Define a name and create a new list for your words. Add words to your lists to learn them later. If you already have some words, e.g. in a file, you can simply import them. Learn the added words using the Test feature. Your answers (correct or not) will be saved to personalize your tests. You can select different algorithms e.g. Random or Below average to make the test even more efficient. To lazy to type? Use buttons to learn the words instead of typing the answer every time. To share lists with other users add them by their email-address and define whether they have permissions to view or edit the list. Keep in mind: To prevent spamming, other users can only see lists you've shared with them, if they have added you in the Users section. Add other users to see lists they've shared with you. The legal information for this site is available at timodenk.com/imprint (German). Abfrage3 is a project of mine. I am Timo Denk and I decided to develop some software to make learning for tests in school easier and more efficient. The advantage of an own website (other websites with similar approaches exist) was the possibility to add every feature I or other users need or will need and of course the fun to program such a big project. Another important point are the test algorithms: They determine which word will be asked next in a test so they have a enormous impact on the total time it takes you to learn a set of words. The chance to write those algorithms exactly as I think it works best does also exist only in a self-written vocabulary trainer. Abfrage3 has a long history: The first version, "Abfrage", was written in Java and looked very awful. It was developed in October 2013. Abfrage2 was not really successful, actually it was just an attempt to create a nice WPF layout which totally failed. In Summer 2014 the third version Abfrage3, a C# WPF application, became the first version in this series of the vocabulary learning software with advanced features like uploading and sharing lists, auto translation and a lot more. It is still available on my german website. Unfortunately this version was only executable on Windows 7 and newer versions, which lead in August 2015 to the development of Abfrage3Web - the website you are currently visiting. The name Abfrage3 is German and the word Abfrage [ˈapˌfʀaːɡə] means something like Test. For traditional reasons, the English version was also given a German name. The 3 stands for the third version (see "What about earlier versions?" above). The big idea of Abfrage3Web was to create a fully functional vocabulary trainer which is fun to use. An important specification was the possibility to comfortably share word lists with other users. The project is open source! The whole code can be found on GitHub. Feel free to send me your ideas, feedback, questions and critique! 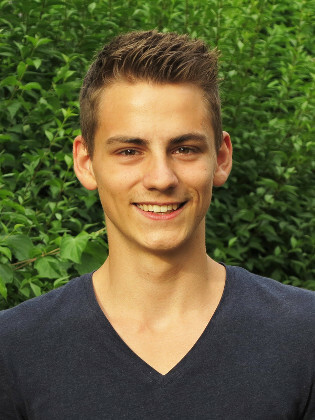 My name is Timo Denk, I am 18 years old and a German student. I am currently studying at Technisches Gymnasium in Waiblingen, Germany. I will get my abitur in 2016. In my leisure time I like to develop software and realize hardware projects. I also do a lot of sports.